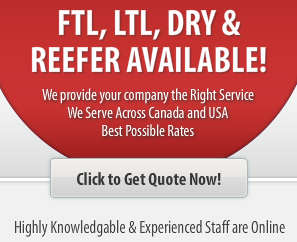 SERVICES - Transnet Freight Ltd.
We make sure that your shipments safely delivered all over Canada and Continental USA. It is our privilege and priority to meet your specific needs and ensure your utmost satisfaction. We guarantee the timely delivery of your goods. We have the right people, equipment and technology to handle your goods and also backed by our 24/7 Dispatch team. We keep close track of all your shipments throughout the delivery process and quickly trouble shoot potential delays. You as a customer can count on damage-free, on-time shipments, with standards that exceed Canadian and US regulatory requirements. Transnet Freight is committed to superior customer satisfaction and total quality management. Our full range of personalized and professional services can be customized to meet your needs, whether it’s local same-day service, truckload shipping anywhere in North America, or warehousing and inventory management services. Keeping every individual customer’s needs and requirements in mind, Transnet believes in providing exceptional customer service – across the country. That’s why we make it our business to understand your needs, right from the start. We are a proud C-TPAT and FAST approved Canada /US Bonded Carrier. All of our equipment’s have the latest E-Z Pass, which ensures more timely and dedicated services.